By Christian Takushi, Macro Economist & Geopolitical Strategist, 21 Oct 2017 – Switzerland. Monitoring developments in Spain this weekend, we see growing signs that point to Madrid making not only preparations to invoke Article 155 – imposing direct rule over Catalonia, but also to use police and military force if necessary. All options are been readied. Apart from the fact that the outcome of the Constitutional Crisis in Spain is hard to predict, it is noteworthy that many in Europe and around the world are struggling to understand how Spain could end up here. risking a chaotic showdown and even a deadly clash that could inflict a lasting damage to its image and cohesion. Spain’s political-military history can help explain some of the lasting entrenched positions though. A quick solution is off the cards after Brussels was seen as taking sides for Madrid – Brussels is worried about the potential clashes and the use of force, and how that could further damage the EU’s image in and beyond Europe. Paris and Berlin are exasperated by the fact that Spain’s Crisis has weakened their hand against Britain. The crisis erupted just as May’s administration was under siege by pro-EU factions and big business lobbies in London. Switzerland is being voiced as mediator, but Madrid is convinced that any dialogue validates the independence bid. I reiterate my assessment .. The somewhat half-hearted approach and lack of charisma of the Catalan President. Unless freedom fighters are willing to fight and die for their cause, they barely stand a chance. Spain has in the past never given independence to any territory that was strategically vital to them (see below how the traumatic history of Spain is catching up with it). The majority of Catalonians are unlikely to join a revolution or uprising against Madrid. Simple demographics: Historically, a median age below 22 years would be ideal for a popular uprising, Catalonians’ average age is between 40 and 45 though. Big businesses are already siding with Madrid – The economic cost could be steep. In average, Catalonians earn 18% more than their Spanish counterparts. Will they risk a temporary erosion of that edge? No foreign power has come to Catalonia’s aid. Not even a small nation in Europe has officially offered recognition. Even self-portrayed neutral Bern, Switzerland, fears Brussels’ anger if it is seen as sympathetic to Barcelona. 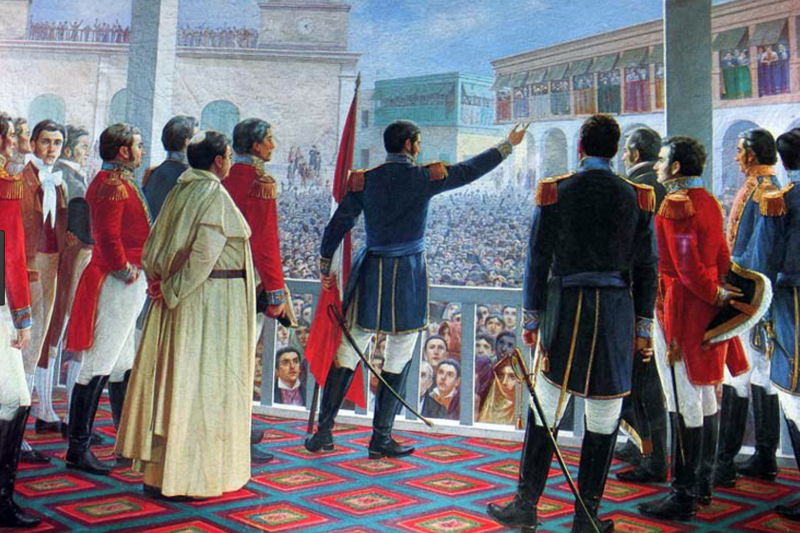 Argentinian General San Martin declares independence of Peru after a 13-year long military struggle against the Spanish Empire. While an armed clash (civil war) is likely to be averted, the likelihood of a bad outcome is unfortunately not insignificant. The unyielding positions exhibited so far can be traced to the history of Spain, which had to sustain very costly uprisings in Latin America and a Civil War at home. There are parallels in both struggles that saw so much human suffering. Even after Argentina, Chile and Colombia defeated Spanish forces and closed in on to liberate Peru, Spain refused to grant independence to Peru (the old Viceroyalty of Lima). Finally Argentinian-Chilean armies under General San Martin and Colombian-Northern forces under General Bolivar helped Peruvian forces defeat the Spanish armies in the decisive battles of Junin and Ayacucho. My point is this: There were 53 years to review the strategy since the major indigenous uprising of Tupac Amaru in 1780 shocked the empire, but all along Spain rejected other strategic options and ended up with the worst possible outcome. a) Spain’s Prime Minister Rajoy leads a minority government – one that was only installed thanks to the Socialist (PSOE) Party’s abstention in the parliament. Thus, the further Rajoy goes, the more likely that parties on the Left could join forces to bring his government down. Rajoy has therefore an interest in hyping the tensions in order to spark national fervour among Socialists. So far he has succeeded in that, partly because the Socialists have been divided. b) Direct Rule by Madrid could unleash far more trouble for Germany and Brussels than currently assumed. It has already begun to weaken the pro-EU forces in London and is by default allowing the conservative British government to take a more self-confident stance against Brussels. The EU is already struggling since the BREXIT campaign to fend off criticism that it is undemocratic and that its EU parliament doesn’t deserve its name. The violent force by Madrid’s national police on 1 Oct 2017 beating voters out of polling stations and Brussel’s implicit approval of it, has been a Black Tuesday for pro-EU leaders in London. They were just about to divide the spoils a few days before as Mrs. May was at her weakest point and most submissive to Brussel’s will. Indeed, to some extent, Strassburg acts as a more symbolic and consultative extended arm of the EU commission. While in the past this didn’t matter so much, currently the EU is preparing punishing measures against key Eastern European member states. Poland and Hungary have been rejecting this as a breach into their sovereignty. Thus, a Direct Rule over Catalonia is likely to expose the deepening East-West rift. That rift became even deeper after Austria – a former close ally of Germany – shifted to the Right last Sunday. Austria will be key for the EU over the next 12 months, as neighbouring Bavaria goes to the polls. Warsaw and Budapest, not only have Vienna’s support for their conservative-nationalist crusade against Brussels, they see growing support for their struggle in Bavaria – The AfD has tripled the number of supporters at the expense of Merkel’s sister party CSU and is exploiting Brussels-sanctioned heavy hand by Madrid in Spain. Conservatives in Europe that are demanding the return of their sovereign powers from a perceived power-hungry Brussels could greatly benefit from Madrid’s Direct Rule. c) Bound by the shadow of its past: bad outcomes and violence cannot be ruled out in Spain. History casts a very dark shadow on Spanish rulers dealing with break-away or independence movements: This is deeply ingrained in Spain’s history, which had to sustain very long and bloody uprisings in Latin America, spanning 53 years. But rather than seeking to limit the loss of life and safeguarding economic interests via a compromise, Spain’s rulers never gave in. So far most analysts see the unyielding position in Madrid and Barcelona as mere posturing. But I humbly believe such a mainstream assessment is wrong. That would have been my first thought in many other countries, but not in Spain. Few analysts had expected Spain would drift so close to the edge of a civil conflict, and we haven’t seen the majority reviewing their assumptions. The Spanish Colony in South America before independence wars. Viceroyalty of Peru, ruled from Lima. Spain’s 53 year struggle to wipe out independence movements in Latin American and its 15 year long war against Peruvian separatists, in particular, probably best illustrates the self-detrimental tendency to unyielding attitudes among Spanish rulers. Peru was strategic, because Lima had been the capital of the Spanish Empire’s American Vice-Royalty for centuries. 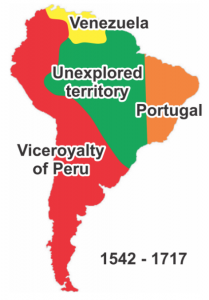 Spain and Portugal both occupied South America for centuries. Just as the Viceroyalty of Peru (Lima) was strategic for Spain three centuries ago, so is Catalonia strategic for Spain today. It is seen by many as the wealthy economic engine of the country. Not all nations digest their history to the same extent, some are shaped by it while others still remain captive to them. The ill-digested loss of the colonies to patriotic separatists in Latin America after a half-century struggle may have helped condition the elite to self-detrimental unyielding positions. The Spanish Civil War was aided by foreign forces, but those took advantage of bitterly uncompromising positions. All of Western and Central Europe was in turmoil after WW1, yet Spain was the only major nation that descended into a total civil war. Even though the unyielding position of the Spanish elites could be considered futile and irresponsible (looking at the human suffering), we should avoid passing judgement from today’s vantage position. What is rather remarkable is that they missed to change course in self interest to safeguard geopolitical and economic interests. For some reason, Spanish rulers were unable or unwilling to learn lessons or change course. From 1780 to 1833 the Spanish Empire fought all movements of independence as criminal rebellions. Spain’s initial reaction was understandable, but the unyielding posture in the last 8 years of that campaign are troublesome. A whole continent was savaged by war & conflict, the resulting distrust would last for centuries. Spain went from defeat to defeat – but refused to change strategy and failed to seek a compromise to better secure its economic interests and save the loyalist armed forces. Finally the defeat and loss was total. This is of course speculation, but had Spain given away independence early on in order to secure peaceful relations and safeguard economic operations, a Spanish Commonwealth could have been feasible. Spain could possibly be a geopolitical power today. The British Empire learnt from the bitter American lesson and pulled out of India, when it realised that a very costly war lied ahead and odds were against them. A possible Direct Rule, state of emergency and a showdown between security forces and civilians could affect the European Union in temporary and lasting ways. While the first impact on the common currency is likely to be temporary, the impact on the Political Process could be lasting as it could feed the new conservative movements across Western and Central Europe. The common currency is unlikely to escape those political and geopolitical aftershocks. With major financial institutions positioning themselves on the Spanish Crisis almost along the BREXIT fault-lines, a break-away Catalonia is likely to see economic hardship at first. But at this current juncture, it is possible that Catalonia could recover over the medium to long term from an initial jump in risk premiums. Its hard working and entrepreneurial people may regain the confidence of the outside world. Who is benefitting from the recent geopolitical developments? Russia and Britain. For different reasons: Russia’s patient but ambivalent strategy is paying off as Berlin talks tough, but gives in. Britain can breathe tactically as Brussels’ contradictory position on Catalonia is exposed (in Kosovo it argued, the Freewill of the people has to be upheld over the constitution of a central government). Obviously, expanding the EU and NATO into Kosovo is a more strategic reward than into Catalonia. But as the threat of nuclear escalation looms in the Middle East and Far East, Britain is increasingly needed by an ill-equipped EU for military protection until the EU can rebuild its dismantled military under one central command. It is a 7 year window some believe the current British government is not strategically minded enough to benefit from. China‘s rulers were too busy domestically in recent months securing their grip on power. But France and President Macron are also beneficiaries. Germany with Mrs. Merkel personally have lost a long time liberal ally in the EU. Austria is the geopolitical gate to the East and it helped for years to contain and appease the Eastern European forces critical of the EU. Austrian’s direct proximity to Bavaria will weaken Merkel over the next 12 months. Merkel depends on the CSU as the core of her coalition, but the CSU suffered catastrophic losses to the AfD in September in their only bastion: Bavaria. And unfortunately the CSU faces the AfDin Landtagswahlen (state elections) in 2018. The mood at the CSU after years of shifting to the liberal center under Merkel’s guidance is not fear, but rather panic. Worse even, Austria and Bavaria couldn’t be more similar economically, religiously and politically: catholic, conservative and economically strong. For years disenfranchised catholic voters had no alternative to the formerly conservative CSU, but that has changed and Austria has shown the way. The rise of the FPÖ into power is likely to help the AfD next door. By 2019 the FPÖ is likely to lose support as it faces the realities of a junior government coalition partner, but Bavarian elections are too soon. Monsieur Macron may now have a one-year window to position himself as the new charismatic leader of Europe. And he is likely to receive the support of President Trump (whose ears he already has). Unlike Frau Merkel, Monsieur Macron has openly told President Trump what he thinks, but without “burning up bridges”. To be fair, France has an historical advantage in the USA that Macron is playing formidably and better than any of his recent predecessors at the Élysée Palace. The Trump administration is dominated by profound admirers of the US Founding Fathers, their faith and struggle for independence. One that was aided by France. Macron’s personal invitation to Trump for the Bastille Day was a genius strike. French intelligence seems to have done its job in briefing the Élysée. But one thing could derail President Macron’s rise, the murky waters of French domestic politics. Ceteris paribus, Macron can win the Liberal Center of Europe more convincingly now that an even younger charismatic conservative leader is rising to the Right, Mr. Sebastian Kurz in Austria. Christian Takushi, Macro Economist & Geopolitical Strategist, 21 Oct 2017 – Switzerland. General Disclaimer for all our research: We provide geopolitical-political analysis only. Global Geopolitical Macro Analysis is highly complex and subject to sudden changes. No analytical method is without certain disadvantages. We may change our outlook within less than 3-6 hours following an event. Global Geopolitical Macro Analysis can be extremely time-sensitive. No comment should in any way be taken as an investment advice or suggestion. One and the same assessment at the geopolitical or macro level can lead to very different rational reactions, because every nation, company or portfolio has different risk tolerances, assets, goals and restrictions.